So much yarn, so little time. : Checkmate! It's a medieval style chess set, inspired by the famous Isle of Lewis chessmen. According to Wiki they were discovered in 1831 and were 12th century! 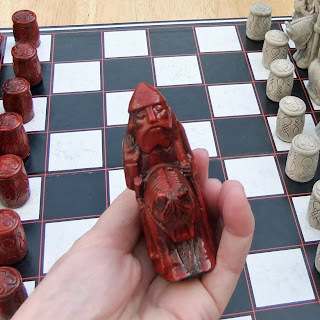 You'll have to go to the British Museum in London, or the Museum of Scotland in Edinburgh, to see the originals, but you can buy these fabulous hand-made replicas from Ogg the Clever. 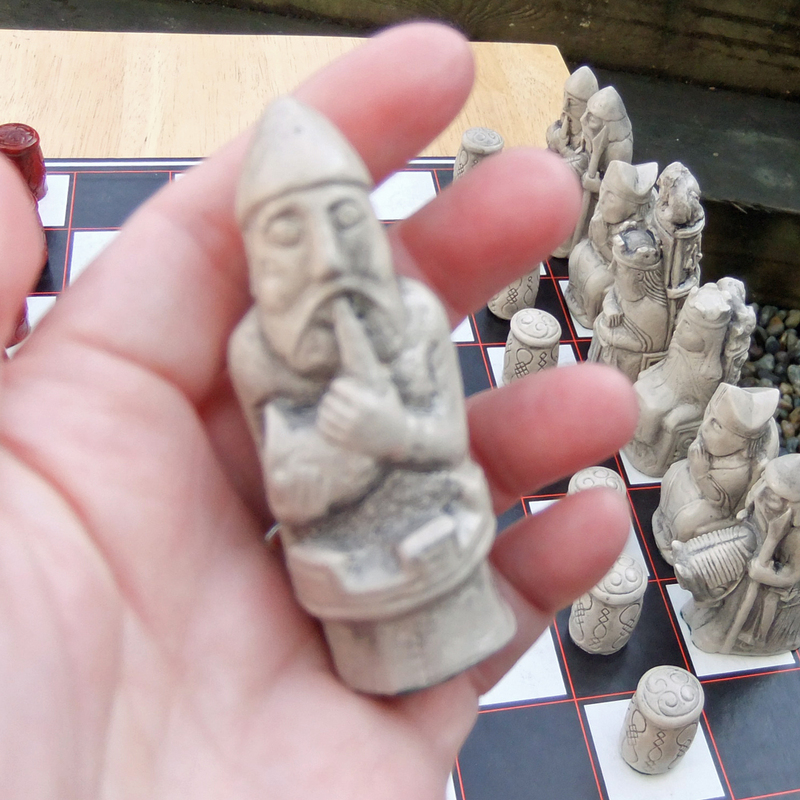 My tatty card chess board does not do them justice, so I'm gong to try to sweet talk my aunt. 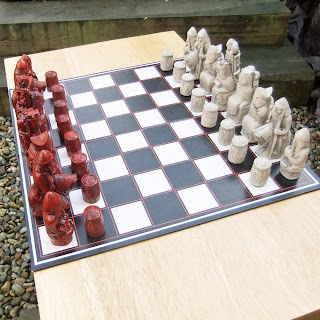 She has a lovely chess table which she's left to me in her will, but I clearly need it now ;-) The table (I must take a pic next time I visit) was handmade by my grandfather who was a master carpenter and builder and these pieces will look stunning on it. Ogg the Clever has other versions too, I strongly recommend a visit to his shop. He says: "Each set is hand cast, painted, stained and lacquered to give a durable high quality result yet still retaining a certain ceramic and antique finish. They also all have hand cut soft felt bottoms, lucky things! The colours for this set are Moroccan Red for the dark and antique stone for the light. The king is approx four inches in height which makes it a little higher than the ordinary Lewis sets and would suit a standard tournament board (not included I'm afraid) with squares about two inches or more." I too am in love with Ogg's pieces! The "Regal" edition is my absolute favourite. At the beach with ... Professor Brian Cox! Guess who I'm seeing tomorrow?